Orabrush is a company that knows its way around the Web. 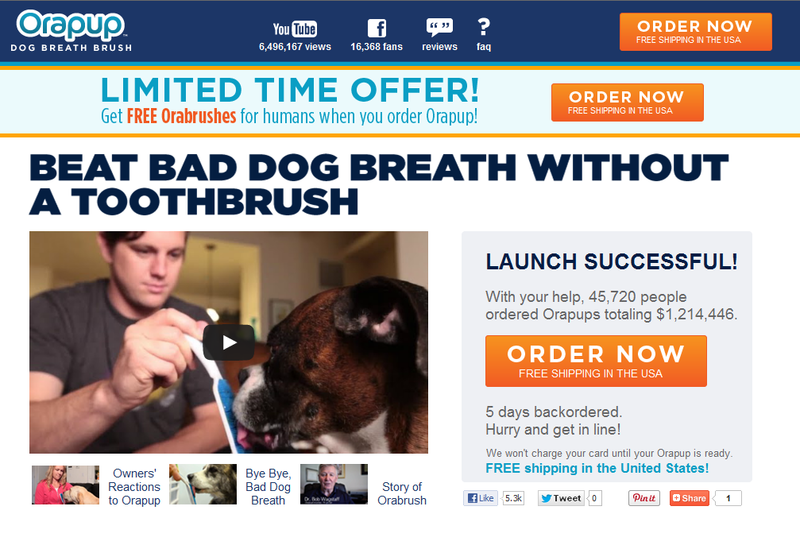 It began selling its tongue-cleaning brushes on a Web site, and eventually though innovative guerrilla marketing, worked its way into a multi-million dollar distribution agreement with WalMart. And today, after more than 50 million hits on its human videos, Orabrush has come up with a new target for its brushes – dogs! Actually, it was Orabrush customers and fans (called “Orabuddies”) who had suggested that the company make tongue brushes to help eliminate doggie bad breath. The company tested the idea through crowd-sourcing site www.indiegogo.com, and raised $60,000 by selling the product, plus getting feedback and market buzz along the way. The new product uses Orabrush’s success with humans to develop a new product and market. The company has found a formula using geo-targeted YouTube advertising to drive sales near stores carrying the products. Orabrush generates online awareness and sales first, then works on offline distribution channels (such as WalMart). And what a market it is – the pet care industry is worth tens of billions of dollars! While Orapup is still a small player in the market, the continuing growth of pet ownership and spending sets it up nicely for continued growth. Start with a discussion about the four basic market strategies: product development, market development, market penetration, and diversification. How can each of these strategies be used for a company? Next, discuss Orabrush in relationship to the four strategies. Which strategy is Orabrush pursuing with Orapup? Why, or why not, will this be a successful strategy? What other tactics should the company use to penetrate this new market?